I had some cooked cracked wheat left over from making a salad for dinner and made use of it in an upma for breakfast the next day. Heat the oil in a pan. Add the mustard seeds. When they start to pop, add the green chillies and curry leaves followed by the chopped onions. Throw in the chopped carrots and peas, and cook till the vegetables are tender. Add the cooked cracked wheat and mix well with the vegetables. Toss in a handful of peanuts. This upma has a slightly nutty flavor and a chewy texture. I like that corn meal dosa, something new to me. Upma looks yummy. this is such a quick upma! Looks so delicious and ofcouse healthy. A filling and delicious meal. This dish looks yummy! Very healthy and simple to make. Yummmyyy..I am a biiig fan of all kinds of Upmas and Shiras ! 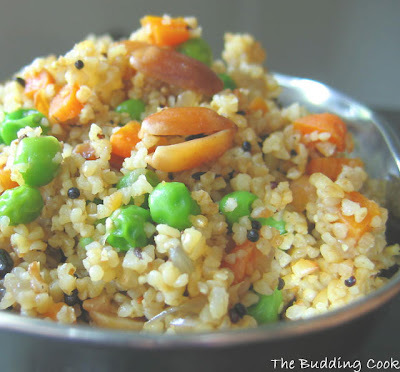 I do this upma often, its so healthy and quick to prepare. I use the frozen mixed veggie. So healthy and looks delicious! Lovely pic :) I really like the way the grains are cracked wheat separated from one another. Beautiful! It was wheat berries over at Srivalli's today and now I see cracked wheat here. Looks like everyone's on eat healthy spree but me! Nice to see your comment in my blog. Thanx. Your corn mealdosa looks nice and new to me, Colourful upma looks great!!!! nice recipe, we make a sort of naadan upma with this. haven't had it in so long. I'll see you on your blogs soon. yum yum!! that sure looks good...lunch hour and trust me i had nothing like this! I have never cooked with cracked wheat before, how interesting. I would love to try my hands at this recipe, especially with the handful of peanuts tossed in! Todd/Diane- Hope you get a chance to try it out!